Click to see a detailed map with birding sites. The Okanogan Ecoregion spans north central Washington from the North Cascades to the Canadian Rockies Ecoregion, just touching the Idaho border near Spokane. On the west and south it is bordered by the Cascade crest south nearly to Rainy Pass; by Sawtooth Ridge northeast of Lake Chelan; and by the northern edge of the Columbia Plateau. The ecoregion extends north along the west slopes of the Rocky Mountains far into British Columbia, beyond Kamloops. The Okanogan may be regarded as a transitional zone between the neighboring regions. It is characterized by long, rounded ridges, rolling plateaus, wide valleys, and large lakes. Elevation ranges from about 700 feet below Wells Dam on the Columbia to about 9,000 feet in the Cascades. The core of the ecoregion is the Okanogan subcontinent, a large island that collided with the old North American continent 100 million years ago; its eastern shore is marked by the Columbia River at Kettle Falls. Its western shore lay along the Okanogan Valley at Tonasket, until another large island, the North Cascades subcontinent, ground its way into the continental mainland around 70 to 40 million years ago. These tectonic forces folded the earth's crust into mountain ranges and provoked long periods of volcanic activity, resulting in the uplifting of the Cascades and the Okanogan Highlands, including the Kettle River Range. Glaciation is responsible for many other landforms, such as hummocky mountains, drumlinoid features, terraces, esker complexes, and glacial lake deposits. The whole ecoregion is drained by the Columbia and its tributaries, most importantly the Methow, Okanogan, Sanpoil, Kettle, Colville, and Spokane Rivers. Franklin D. Roosevelt Lake, backed up for 130 miles behind Grand Coulee Dam, is the largest freshwater body in the state. Climate in this ecoregion is generally warm to hot and dry in summer and moderately cool to cold in winter. Additionally, the climate varies greatly with elevation. Mean annual precipitation ranges from 10-12 inches in the major valleys through 16-24 inches in the plateau areas, rising to over 40 inches in the subalpine and alpine zones. The ecoregion is influenced by extremes of hot, dry air from the Columbia Plateau in summer and cold arctic air from the north in winter. Mean annual temperatures for the major valleys hover around 42 degrees F, with a summer mean of about 65 degrees F and a winter mean of about 35 degrees F.
Vegetative cover varies widely within the ecoregion due to elevational differences. 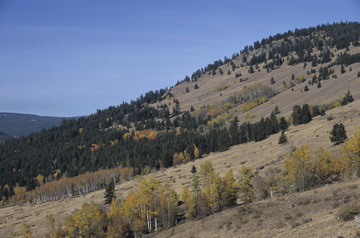 Conifer forests dominate mountain ridges and low hills, while valleys and lowlands are often non-forested. The very local alpine environments contain various herbs, lichens, and shrubs, whereas the more widely distributed subalpine regions are dominated by tree species such as subalpine fir, Engelmann spruce, and lodgepole pine. Below this zone are very extensive forests characterized by ponderosa pine, Douglas-fir, western larch, lodgepole pine, and quaking aspen. Wetlands, include riparian, marsh, wet-meadow, and lake habitats, are widespread but with concentrations associated with Sinlahekin Creek and the Similkameen, Methow, and Okanogan Rivers. Less than 10 percent of the Washington portion of the ecoregion has been converted to agricultural or urban use. Development is mainly concentrated in the Spokane, Colville, Methow, and Okanogan valleys, with urban development, irrigated orchards, open rangeland, and hay fields intermingling with riparian habitats. In many areas, decades of fire suppression have resulted in a landscape composed of dense, fire-prone forests. The Canadian part of the ecoregion, most notably the Okanagan Valley, has seen much greater habitat changes with near-complete replacement of grasslands by settlements, orchards, and crops.